VietNamNet Bridge - The forests in the central region and Central Highlands still continue to be felled despite the Prime Minister’s order one year ago to close natural forests. Reporters visiting Ward 693 of Tan Thanh commune in Quang Tri province in late June saw a barren bald forestland. Hundreds of cut trees were on the ground. In the middle of rice and bananas fields, there were many trees with only stumps left. The guide said the deforestation in the ward has been occurring at a ‘skyrocketing speed’. In order to get land for cultivation, people are willing to chop down trees. Ward 693 covers an area of 1,190 hectares, including 539 hectares of bare land, 391 hectares of planted forests and 341 hectares of restored natural forests. According to the Huong Hoa Protective Forest Management Unit, by March 9, 3.85 hectares of forests in the ward had been found devastated by 13 people in the locality. The forests in the central region and Central Highlands still continue to be felled despite the Prime Minister’s order one year ago to close natural forests. Vo Van Su, head of the Forest Rangers’ Unit in Huong Hoa district, affirmed that the deforestation to get land for cultivation in Ward 693 ‘stopped a long time ago’. On June 22, forest rangers had an inspection tour to the site and did not discover illegal logging. After reporters showed the pictures they took, Su said this needs ‘examination’. Quang Nam province was praised for its drastic measures to protect forests as the local authorities ordered to close the natural forest 15 years ago. However, the province has become one of the ‘hot spots’ in deforestation. Several deforestation cases occur there every year. The most serious case was the Fokienia devastation in July 2016, which the local press called a ‘massacre’ in the Vietnam-Laos border area, belonging to Nam Giang district, which was put under strict control – nobody in, nobody out. The case could be seen as a challenge by illegal loggers to the local authorities as it occurred just one month after the PM’s order on forest closure. 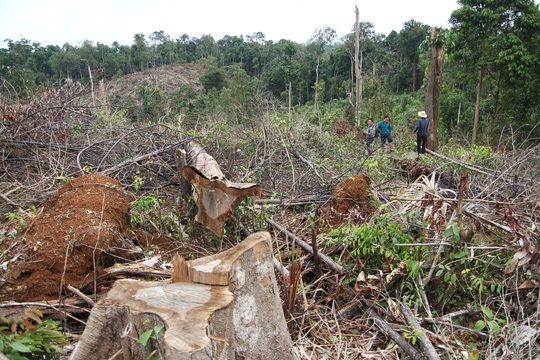 The forests in Quang Nam province continue to be cut down. Every few days, investigative agencies discover a case of carrying illegally felled wood from forests. On June 18, the police of the Dai Loc district discovered two people carrying 4 cubic meters of wood on a boat on Vu Gia River. However, they escaped in the darkness in front of the policemen. In Lam Dong province, nearly 1,500 forest trees have been chopped down, and police have not found the culprits.